Hi, I'm Daci, and the coffee cup above is pretty much the story of my life. When I have grandchildren, I'll gather them around my rocking chair and fill hours upon hours with stories of how no one, ever, could get my name right. It was sixth period, my junior year of high school, when I decided I wanted a friend to ride the bus home with me. But there was a problem: we needed a parental note. We were 16, people. We wrote the note ourselves. I handed the note to my bus driver, who -- important to the purpose of this story -- was African American. She saw right through my little scheme. "That's not a real note, Dicey. Your friend is not getting on my bus." 1) They all despised me for some reason. 2) They all called me Dicey for some reason. Of all the ways to butcher my name, every single bus driver chose the same, strange way. I thought about convincing my bus driver that my father did, in fact, dot his I’s with a circle (oops, forging oversight). Instead, I turned on my heel and stomped out, mumbling, “I guess my dad will have to come pick us up." The note, I thought, terrified. I had forged an adult’s signature. Could I go to detention for that? Detention seemed like a scary place. Or what about jail? Forgery was a crime people went to jail for, right? Or was that perjury? I was too busy worrying about perjury to listen to the bus driver recount the story of the note. Until, that is, she got to the last part. Then I realized that a combination of braces and mumbling and general teenage angst makes "I guess my dad will have to come pick us up" sound a lot more racist than it actually is. My principal looked shocked. “Daci said that?” she asked. “Dicey said that,” confirmed the bus driver. I was forced to apologize. My bus driver had to leave for some reason -- either a meeting of the Bus Drivers Against Dicey Meeting or a bus drivers’ mixer so that they would know to wave as their buses passed each other* – and my apology was, surprisingly, accepted. But I know my bus driver never forgot about Racist Dicey. * Did anyone else’s bus drivers do this? They never missed the opportunity to wave at passing bus drivers. I always wondered if they got in trouble if they forgot. 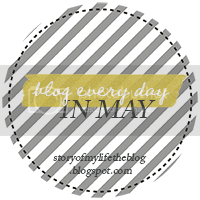 I'm blogging every day in May (well, we'll see how it goes) -- and you should too. Jenni's got prompts and everything (which I PROMPTly ignored today).